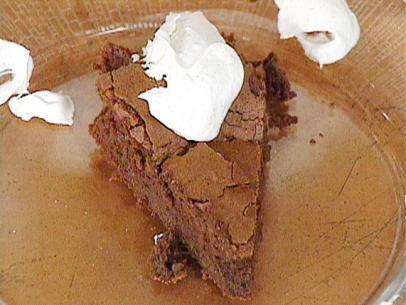 Chocolate-Ancho Chile Flourless Cake recipe–it’s National Chocolate Cake Day! Lightly butter the bottom and sides of a 9-inch springform pan. Line the bottom with parchment paper and butter the paper. Set aside. In the top of a double boiler **, melt the chocolate and butter over medium-low heat. Remove from the heat and whisk in the cocoa, chili powder, and salt. In a bowl, whisk together the egg yolks with 1/2 cup of the sugar until thick and pale yellow in color. Fold the chocolate mixture into the yolks and mix well. In another bowl, whisk the egg whites until thick. Whisking, add the remaining 1/2 cup sugar gradually and continue to beat to form a light meringue. In several additions, fold into the chocolate mixture, being careful not to deflate the meringue. Gently pour into the prepared pan and bake until the edges are set but the center is still moist and a few crumbs stick to a tester, about 45 minutes. Remove from the oven and cool completely in the pan on a wire rack. Run a thin, sharp knife around the edge of the cake. Remove the pan sides and gently lift away the cake. Invert onto a cake plate, remove the bottom and peel away the parchment. In a bowl, beat the cream with an electric mixer until frothy. Add the confectioners’ sugar and cinnamon and continue to beat until the cream holds soft peaks. To serve, slice the cake with a portion of the sweetened whipped cream. Garnish with cocoa powder and serve. * I substituted red chile powder for the ancho powder, which can be difficult to find. ** I didn’t have a double boiler readily available. I used an 8-inch straight-sided pan half-filled with hot water and brought it to a simmer. On top I used a shallow metal bowl so the bottom of the bowl was just above the hot water.